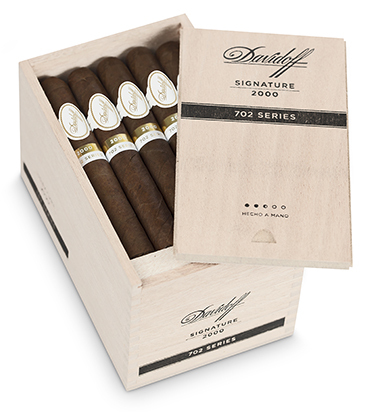 With Davidoff's 702 Series, its master blenders have reimagined and reinvented select formats in the Signature and Aniversario cigar series, breathing new life into them with the legendary 702 Ecuadorian wrapper born from the hybrid of three Cuban Habano seeds. While the filler and binder tobaccos used in the treasured classics remain the same, the mild Connecticut wrapper is replaced with the more intense and spicy 702 Habano wrapper grown exclusively for Davidoff in the Andes foothills of Ecuador's Cotopaxi province. The Signature 2000 with its fresh floral scents mingling with earthy, woody notes, and a hint of sweetness now delivers deep flavors of coffee, wood, and leather with a creamy aftertaste. The Aniversario No. 3, Double R, Special T, and Special R cigars that Davidoff connoisseurs know and love for their exquisite aroma and carefully balanced blend of tobaccos are now intensified with a bolder taste experience.